With acknowledgement and thanks to the late Colonel Dr Roger Freeman, OAM, author of "Hurcombe's Hungry Half-Hundred", an anthology of photographs and letters of the men of the 50th Battalion, and Major Adrian Craig of the RAR Association. The 50th Battalion was raised in Egypt 1916 as part of the process that was known as "doubling the AIF" to create the 4th and 5th Divisions. On return from the Gallipoli campaign to Egypt, the Australian Brigades (1st, 2nd, 3rd and 4th) of the ANZAC Corps formed the basis of the creation of the 4th Division and 5th Divisions. To create the new Divisions, sixteen original battalions were 'split' to create the new so-called "pup" battalions. By seeding the new Battalions with a core of experienced Officers, NCO and soldiers from the parent Battalions and reinforcing them with newly arrived recruits from Australia, the "doubling of the AIF" was achieved, although not without some angst when the original battalions were split and former comrades went their separate ways. The 3rd Brigade was split to generate the 13th Brigade which included the 49th (Qld), 50th (SA), 51st (WA) and 52nd (WA,SA and Tas) Battalions. 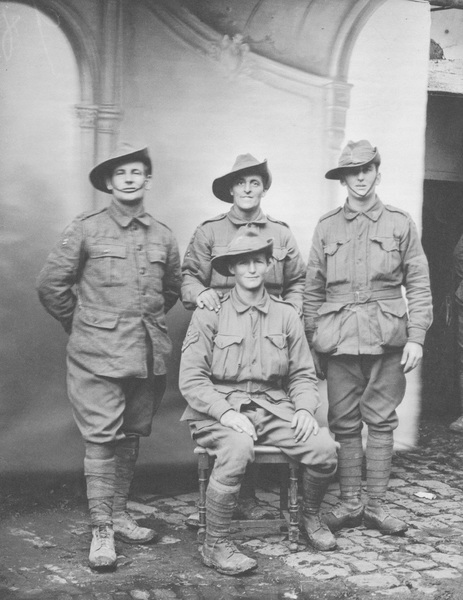 They were formed from the 9th (Qld) , 10th (SA) 11th (WA) and 12th (Tas) Battalions respectively. Together with the 13th Brigade, the 4th (an original ANZAC Brigade) and 12th Brigades comprised the new 4th Division. The 50th Battalion was thus the 'pup' of the 10th Battalion, and shared the same purple and blue colours in its 'patch' as its parent but of the circle shape to signify a 4th Division unit in the 13th Brigade. Its soldiers were similarly drawn largely from South Australia. The 50th Battlion's inaugural Commanding Officer was Lieutenant Colonel Frederick Hurcombe, the original Second in Command of the 10th Battalion on its formation in August 1914. So the 4th Division made its way to France in early 1916 via the Mediterranean port of Marseilles and a rail journey through the centre of France. After arriving in France on 11 June, 1916, the 50th Battalion was part of the concentration of the 1st, 2nd and 4th Divisions in the Somme sector and shortly thereafter, the Divisions were committed in succession to the attacks around the village of Pozieres. The 4th Division was assigned the capture of the ground around the Windmill Feature north east of the village of Pozieres on the 4th August. The 13th Brigade was in Reserve for this part of the operation. 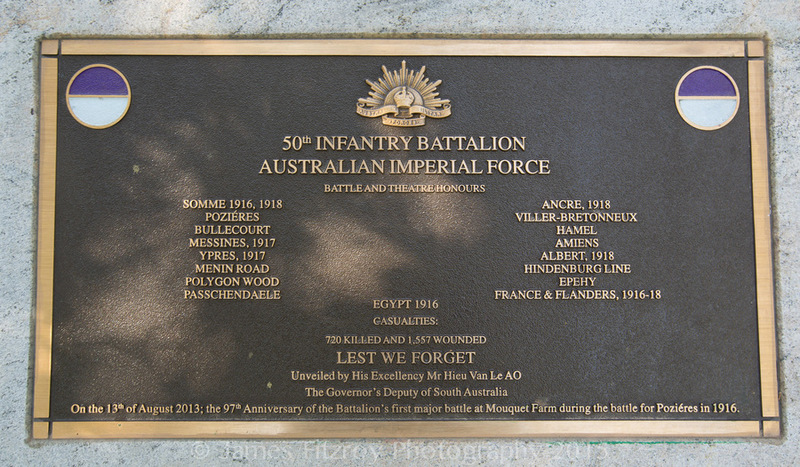 The 50th Battalion was therefore not committed to its first major battle, at Mouquet Farm, until the second phase of the fighting between 13 and 15 August. Like all of the troops engaged, the 50th Battalion suffered heavy casualties. Early in 1917, the battalion participated in the advance that followed the German retreat to the Hindenburg Line, and attacked at Noreuil on 2 April. 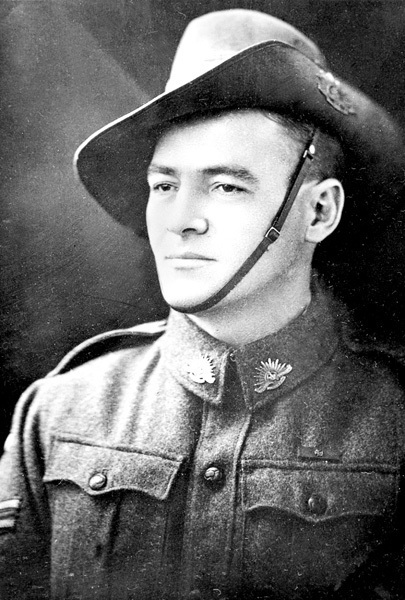 For his actions at Noreuil Private Jørgen Jensen was awarded the Victoria Cross. Later that year, the focus of AIF operations moved to Belgium. There the battalion was involved in the battle of Messines between 7 and 12 June and later in the campaign known as Third Ypres beginning with actions to the south of the town culminating in the battle of Polygon Wood on 26 September. Third Ypres ran out to the mud and misery of Passchendaele. Another bleak winter of trench routine followed. Reinforced by troops freed by the collapse of Russia in October 1917, the German Army launched a major offensive on the Western Front at the end of March 1918. The 4th Division was deployed to defend positions south of the River Ancre in France. 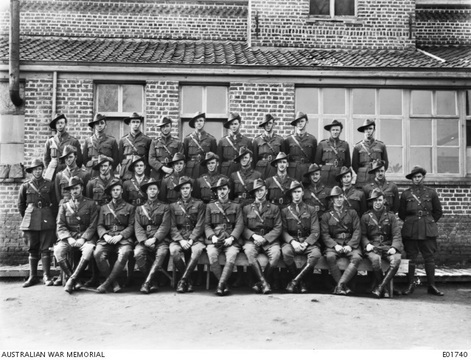 At Dernancourt, on 5 April, the 50th Battalion assisted in the repulse of the largest German attack mounted against Australian troops during the war. The German threat persisted through April, and on ANZAC Day 1918 the 50th participated in the now-legendary counter-attack to dislodge the enemy from Villers-Bretonneux, attacking on the southern flank, complementing the 5th Divisions 15th Brigade to the north. It sustained heavy casualties and many of the bodies of the fallen were never identified. The 50th Battalion continued to play an active role during the Allies own offensive, launched on 8 August 1918. Its last major operation of the war was the attack on the Hindenburg Line on 18 September, during which the 50th composed part of the 4th Division‘s reserve. The 50th Battalion ceased to exist as a separate entity when it amalgamated with the 51st Battalion on 6 March 1919 as soldiers were repatriated home. Extract from Dr Roger Freeman's book "Hurcombe's Hungry Half Hundred"
Letter from Major Harry Seager (50th Battalion) to Mr Armitage. You asked for a description of the doings of the 50th [battalion] from the 20th March, 1917, to 3 April, 1917, and the last days of Harold. Well, I shall endeavour to do so, as best I can. On about the 20th March the Battalion moved up from their billets at Buire (their advance base) to participate in the great German retreat. After leaving Buire we camped in huts at Mamety Camp, just beyond Albert on the Somme battlefield, for a few days. Nearly every afternoon Harold and myself used to go for long rides. On Sunday afternoon we visited Pozieres and Mouquet Farm, the place where he had fought and suffered so much. Even then the mud was so bad we had to dismount and leave our horses. The shell-fire had been so terrific there was no a blade of grass left, and the fields was still littered with fragments of unburied dead, equipment, etc. I saw the site of Harold’s Company Hqrs in a shallow trench, and knew what he had been through. If anyone deserved a decoration for those awful days of fighting, he did. We inspected the farm itself – and no wonder it could not be destroyed by shell-fire. It was a veritable fortress with fortified cellars, deep dug-outs underneath them, and tunnels leading to goodness knows where. A day or so afterwards the Battalion moved right across the Somme field, past High Wood and other historic places, and billeted in British and German dug-outs at La Sars (near the great Butte de Warlencourt), a great mound three hundred feet in circumference, erected by some prehistoric people over their dead, killed in some big battle. Next morning, the Colonel rode ahead and order his four company commanders to follow him early that afternoon, leaving the battalion to be brought on by his Second in Command. Harold, Todd, Churchill-Smith and myself started early that afternoon and joined the main Albert-Bapaume Road near the Butte. The old Roman road was a sight to be seen, packed with transport, guns, ammunition and troops all moving forward. Every now and then we would come to a mine crater in the middle of the road and engineers intensely repairing the damage. Bapaume itself was a terrible wreck. Every house and building had been blown up. As we passed the place where the town had been, we could see men still digging out their comrades. Not one stone remained upon another. It must be remembered that the Hall had been previously blown up, but was blown up again by a delayed-action fuse some days afterwards, when some troops were in it. One of the very few ruses of the Germans that were successful. After passing through the town we came to open country, here and there defended by strong systems of trenches and wire, but still given up by the Germans for some reason without striking a blow. Along this road we found the Colonel awaiting us. He took us to the ruined town of Vaulx-Vraucourt. Most of the roads in France were broad, with avenues of trees. But in this country the Germans had cut down all the trees on one side of the road. In Vaulx I also saw fruit trees and rose bushes cut down. Packs, valises, etc., were dumped just before the Battalion entered Vaulx. Transports, cookers, etc., were also left there. A, C and D Companies proceeded straight to the outpost line and B Company and Headquarters stayed in Vaulx. About the 30th or the 31st of March, B Company took over the line from A and C Companies, which returned to Vaulx. I relieved Harold and had a long talk to him that night. I shall not describe the outpost work or patrol encounters to you, but will get to the main attack. The battle on the 2nd of April was not only carried out in Noreuil, but other Divisions took part and it resulted in the capture of several villages. Noreuil is a village lying some miles north-east of Bapaume. In front and to the south of the village ran a low ridge almost east and west of the village of Queant is a valley – a dismantled railway track ran along this valley. On the north of the village and valley is a plateau running away to the north towards Bullecourt and the Hindenberg Line. Longatte is almost a mile to the west, slightly north of of Noreuil. Lagnicourt was less than a mile to the south-east of Noreuil, and just behind the ridge about three miles to the south-west lay Vaulx. Out outpost line through Lagnicourt on the east, along the reserve slope or crest of the ridge in front of Noreuil, around Longatte, and then north-west to Arras. The village of Noreuil formed a slight salient into our line. The Germans were slowly falling back upon the Hindenberg Line, destroying villages, etc., as they went. They defended their line by a system of rearguards and outposts, comprised of their best troops. Most of Noreuil had been destroyed or mined. Its evacuation was forestalled, by our attack, for twelve days. The Germans defended Noreuil with the 119th and 120th Regiments (3rd Guard Division). The village was very strongly held on the western side and by fortified, sunken roads on the south and eastern side. The German line ran along the southern ridge. This was protected by a belt of wire which could not be seen from the top of the ridge owing to the convex slope. The supports were in the sunken roads to the north and west of the village. The 52nd Battalion in front of Lagnicourt had to advance in a north-east direction for a few hundred yards on to the crest of the southern ridge, and then dig in. This involved practically two waves of two platoons each (four lines). The other company (which was to sweep to the right of the village) formed one wave, with one platoon of the Reserve Company in support. (The platoon joined the company before the attack, that lasted five minutes, and was wiped out.) The frontage for the Battalion was between 600 and 800 yards. The remaining three platoons of the Reserve Company spread across the two thousand yards of front and held the line while the others were forming up. The 51st battalion were to attack Noreuil directly in a north-east direction. Their right to get in touch with the 50th in the village and their left to get in touch with the 2nd Gordons (who were to attack Longatte). I have forgotten the hour; it was 4:30 or 5:30 a.m. Anyway, it was dark. While the Battalion was waiting on the tapes, I saw Harold and we had a few minutes’ chat. He was very game. He had a presentiment that he would not come through. I remember him saying to be careful of the enemy protective barrage that was sure to descend on the outpost line. He was full of spirit and confident of victory. At zero hour the guns flashed out and the German Very Lights and S.O.S. signals lit up the sky, making a pretty awe-inspiring sight. All the troops sprang up from the tapes and followed the barrage closely. The Germans were taken completely by surprise, and in the middle of the relief, so were about eight minutes getting their barrage going along the southern ridge. Once over the crest the German machine guns began to rattle out and their own troops came under a deadly fire. On the left of the Battalion the leading wave were mowed down by machine guns concealed in the houses and a piquet in the sunken road. Here the gallant Lieutenant Hoggarth fell. Also that equally gallant gentleman, Lieutenant Bidstrup. His body was found surrounded by a number of dead Germans. By this time the 51st Battalion began to attack from the left and some of our own men had worked around to the right of the cemetery; thus, the Germans found themselves practically surrounded. With a cheer, both Battalions joined and swept into the village to victory. In the centre of the Battalion they had also suffered machine gun fire before entering village and here also the gallant and lovable Lieutenant Jose fell. The company on the right, although coming under fire, met with better luck. The machine gun situated on the sunken road leading from Lagnicourt to Noreuil was destroyed by the first shot from a trench mortar. Advancing over these positions the company was held up by the belt of wire. For a few moments the positions was critical; however, the wire was crossed with a rush. The company entered the valley and then swung to the right, but they had gone too far before wheeling, consequently losing touch with the 52nd Battalion just to the right of the road mentioned. Here Lance Corporal (then Private) Jensen won his V.C. by capturing about 60 Germans. The boys on the left and the centre, together with the 51st Battalion, swept through the village, wheeled, and took up a position in the partially-dug trench on the high ground north-east of the village. They were in a trench with the Scottish, who took Longatte on the left, and their right rested about 50 to 100 yards from the edge of the valley. They had advanced about 2000 yards and were only 200 yards short of their final objective. The right company in the valley met with hard fighting right along it and when our second barrage opened, owing to it being a bit ragged, suffered heavy casualties. Here it lost touch with the left, too. Some of them reached their final objective but they were enfiladed from both flanks, from a sunken road on the ground about 200 yards in front of the other companies, and also from the sunken road in front of the 52nd Battalion on the southern ridge. They were also heavily attacked from the front. Some 300 Germans running from the village attacked them from the rear. Outflanked and surrounded the end came quickly and, after a short, unequal fight some 100 surrendered. The Germans then turned their attention to the other two companies of the 51st in the trench. From the sunken road in front of them the Germans bombarded them with pineapple bombs (trench mortar) and enfiladed them with machine-guns from the sunken road on the southern ridge in front of the 52nd Battalion. They also bombarded up their trenches some way from where it ended on the north side of the valley. Losses were heavy in some places and the trench soon filled up with dead. It was in this trench that your very gallant son was killed during the latter part of the morning on the 2nd of April, shot through the head while looking over the top of the trench to see what had become of the companies in the valley. His last words were “watch the right flank” just before he looked over the top. His poor men were heartstricken with grief, and I saw his lying in the trench that morning and heard the details. It was a terrible shock. He was buried beside Lieutenant Rule in a little quarry by the side of a road in the valley, and a cross erected. He had done splendid work that day and, if he had been spared would have been rewarded. The Germans had suffered heavily while running away. The ground in front of the trench and around the sunken road was covered with dead. The gap so caused in the line was serious. The 52nd Battalion, who had dug in on the crest of the southern ridge, could not see or command the valley, thus leaving it open for the Germans to retake the village, envelop the Brigade or cause them to fall back, and possibly the Brigade on its left. On receipt of a pigeon message from Harold, saying some Germans had been overlooked in the village and were causing trouble, the Colonel ordered one platoon from Reserve Company under Lieutenant Rule to move up to support the company in the valley, and the two remaining platoons to mop up the village. Going over the southern ridge this company had to pass through the enemy’s barrage, and consequently suffered casualties. On discovering the fate of the right company, this company was thrown into the gap and advanced up the valley without artillery support. Before going far it came under the same murderous fire, enfilade and frontal, also heavy shelling from the field guns, 5.9 inch. Within 200 yards of the sunken road these attacks were held up, and the company took up positions to cover the valley and protect the flank of the Battalion. The Germans, being so prevented from pursuing their attacks against the Battalion’s flank, devoted their attention to the newcomers. Towards evening the enemy, under cover of a heavy bombardment, massed for a counter-attack along the whole front. But snow was falling and the enemy were plainly visible to the troops on the high ground. In answer to the S.O.S. signals out artillery played such havoc with them that the attack never developed. That night touch was gained with the 52nd battalion and the gap was closed. Next morning this company now 60 strong) appeared to again attack the sunken roads. However, it proved unnecessary as its patrols reported that the enemy had evacuated them and the positions were occupied without opposition, and quantities of material and several wounded prisoners were found there. Patrols followed up the remaining enemy who had fallen back on Queant and Bullecourt. The next night the whole line was advanced for a distance of 1900 yards.